Come out for a wildly entertaining evening on Saturday, September 30, to watch the Harlem Wizards play a friendly basketball game against our very own Elmhurst teachers and school district principals! All of us at Elmhurst Toyota encourage you to attend. This fun event for the whole family benefits local public school educational programs and enhancements for students. The Harlem Wizards put on quite a show as they slam dunk their way through a game that combines crazy good basketball skills, comedy, and plenty of audience participation. 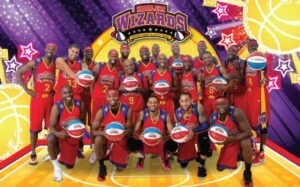 And kids always enjoy watching the Harlem Wizards run circles around their school principal or teachers. Last year, the Wizards’ three teams played in more than 400 cities across the United States. The Wizards’ 2017 roster of talented players includes former Harlem Globetrotters Dwayne “Swoop” Simpson, Eric “Broadway” Jones and Arnold “A-Train” Bernard, as well as slam-dunk champ Lemarvon “Showtime” Jackson, “King Arthur” Lewis and James “The Roadrunner” Tyndal. Other standouts include FIBA 3-on-3 U.S. team champs led by Devon “Livewire” Curry and Roscoe “Sarge” Johnson, whose 360 dunk during a Wizards game was featured on ESPN’s online dunks of the week and viewed more than 100,000 times. It will be an unforgettable evening, so be sure to get your tickets before they sell out. September 30, 2017, 5 p.m. Doors open at 4 p.m.
General admission seating is $12 in advance and $18 at the door. Reserved seating is $25 (includes seats in the first five rows plus a $5 merchandise voucher). Courtside Plus seating is $50 (includes 10 minute meet & greet with 2-3 Wizards, souvenir lanyard, free team photo, and $10 discount on Wizards replica jersey). Purchase tickets online at www.harlemwizards.com. Go to Schedule & Tickets, search for your event date, and click the “blue select” button to purchase. You can also buy tickets in-person at the Elmhurst Community Unit School District Foundation office located at 162 South York. The Foundation office is open Monday through Friday from 9 a.m. to 4 p.m. The Foundation accepts checks and cash only. Tickets will be sold, while they last, until 2 p.m. on September 29. Call 630-617-2328 or visit www.elmhurst205.org/Foundation.